It's been a busy year for Prince Harry. In May millions of people around the world watched him become the Duke of Sussex as he married Meghan Markle at Windsor Castle. A few months later in October the couple announced they are expecting their first baby and just days later they flew to the other side of the world for a 16-day tour Down Under. But it's not just Harry who's been busy. The prince's hectic schedule has made for a jam-packed 2018 for his lookalike, Rhys Whittock, too. 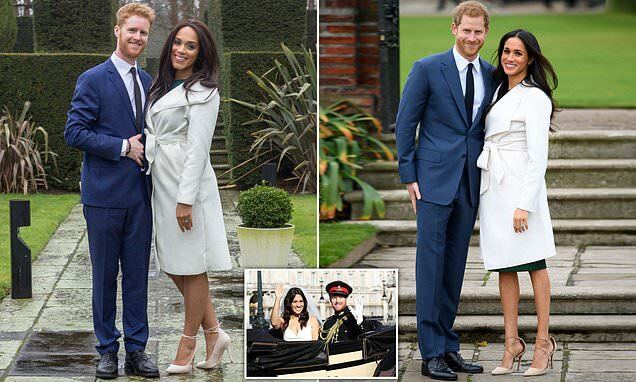 Rhys, 35, is almost exactly the same height as the Duke of Sussex, 34, and nearly the same age, as well as sporting the same head of red hair. Friends, family and strangers have been pointing out his royal resemblance for years, but it wasn't until Harry-and-Meghan-mania swept the country with news of their engagement in November last year that he started to take them seriously. In just a few months the Welshman went from a quiet life as a property developer in the sleepy Kent village of Greenhithe to travelling the world as a fully-fledged Prince Harry lookalike. He told MailOnline: 'Since March, I've been on the side of a London bus, flown to Hong Kong to play Harry at a millionaire businessman's birthday party and been on live TV. It's surreal. 'I never used to think much of it when people would stare at me at weddings and tell me I looked like Prince Harry. 'Most lookalikes don't see the resemblance between them and the person they're impersonating.